The award-winning Bladesmart was designed by a Scrub Nurse in order to reduce the incidence of sharps injuries from hand-passing of sharps in operating theatres. Unlike kidney dishes, Bladesmart's revolutionary design ensures safe scalpel transfer between surgeons and scrub nurses by shielding the sharp section of the blade while leaving the handle free to be grasped safely. Bladesmart has easy holding points and finger shielding for maximum protection and is suitable for a wide range of scalpel handles and blades, drain trocars, suture needles and K-Wires. Winner of the Medical Gold Medal at the World Inventions Expo, Geneva, Switzerland, Bladesmart is available in sterile or non-sterile versions. Bladesmart brochureBrochure explaining features and benefits of the Bladesmart sharps transfer tray. 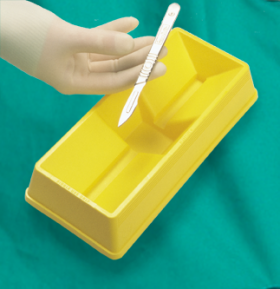 Video explaining features, benefits and usage instructions for Bladesmart safety tray for transfer of scalpels and other sharps in Operating Rooms.